1988 Topps Football might not be high on the collecting list for cards from the 1980s, but the product makes for a fun budget break and allows collectors a shot at base cards for some of the top players from the era. More recently, the simple base design was featured in 2013 Archives Football. 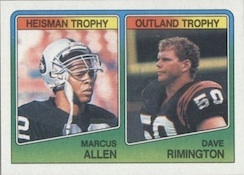 Even with 396 cards, the 1988 Topps Football rookie checklist is not incredibly deep. 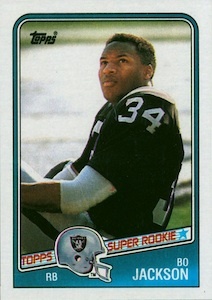 The Bo Jackson rookie is the clear top card found in the product. Other key rookies include Vinny Testaverde and Hall of Fame defensive end, Chris Doleman. 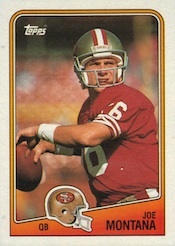 Jerry Rice, Joe Montana and Dan Marino are among the best veteran options found in the set. The 1988 Topps design is not as well-loved as other designs from this period. The rounded border leaves a lot of white, which can make centering a problem. Instead of referencing the specific NFL team by name, each player is identified by his name and a team helmet. The card backs are dominated by a faded blue color, with the player's biographical information on the top and stats listed on the bottom. Falling one per pack, 1000 Yard Club glossy cards consist of 24 players who either reached the mark by receiving or rushing. The only other option is literally printed on the bottom of the card boxes and cut by hand. The total Box Bottoms checklist includes 16 cards, with two payers on each card. Each box includes four cards. Traditional 1988 Topps Football wax boxes include 36 packs, with 16 cards per pack, while cello boxes include 24 packs and 30 cards per pack. Both the wax and cello packs include a stick of gum. Lastly, rack pack boxes include 24 packs per box, and 43 cards per pack. 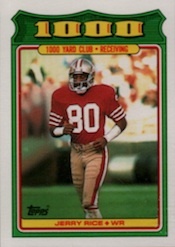 With limited prominent rookies and a high production rate, 1988 Topps Football maintains low values and are still easily found today. Decent set with the Bo Jackson rookie. Plenty of stars including Marino, Elway,Rice and Allen. Nice design. 1988 TOPPS FOOTBALL SET ALL-396-W Binder & Ultra Pro Sheets-MINT! !